Before there was Hollywood there was Buffalo Bill’s Wild West. The show was never referred to as a “show” and in its title it covertly suggested that it was a reflection of real life, a west that was “Buffalo Bill’s” west. 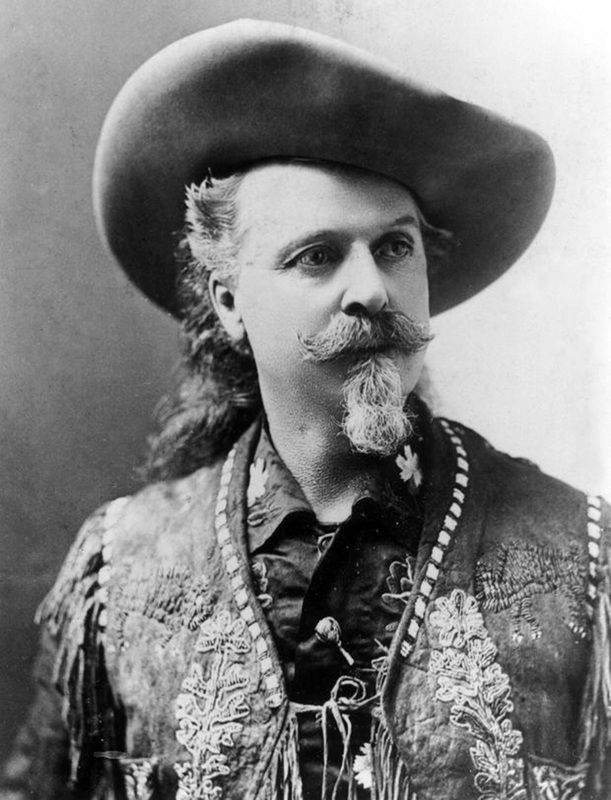 Buffalo Bill’s show and the dime novels inspired by him set the tone for Hollywood. Get hold of something that is true, or at least believable, extend it somewhat to make it entertaining, and create something that your audience would like to believe is reality. 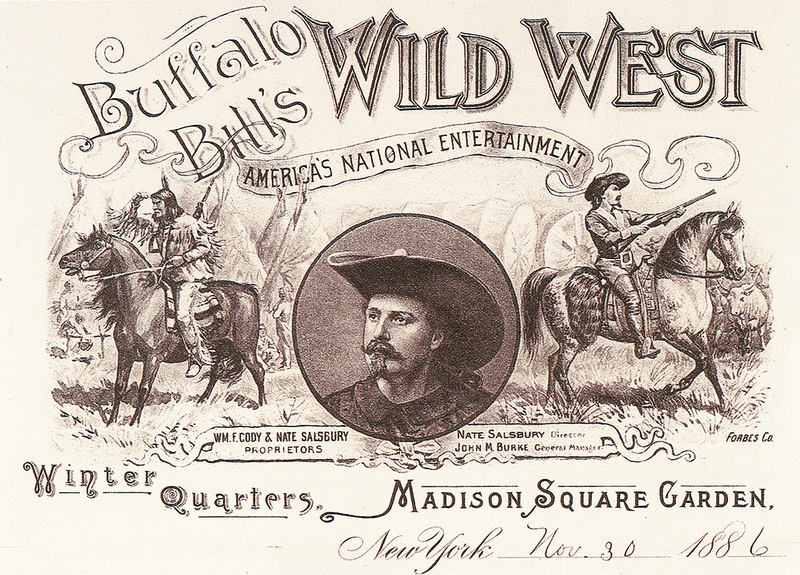 Buffalo Bill’s Wild West presented audiences with a taste of what the real Wild West had been like, as much as a show can do. Fact embellished with fiction, but realistic nonetheless. Hollywood picked up where Buffalo Bill left off when he passed away in 1917. It didn’t take long for Western Movies to appear, very much created in the Buffalo Bill’s Wild West image, and when television came along the Westerns came thick and fast beamed straight into people’s homes and minds. Buffalo Bill’s legacy is with us today. Buffalo Bill’s show staged things so well that novelist Mark Twain said of it “Down to its smallest details, the show is genuine”. William Cody was born in 1846 into a family that was anti-slavery and so actively so that William’s father Isaac was stabbed at a meeting by a slavery supporter who didn’t like what he had to say. A stabbing that would cause his death three years later. This was to force the eleven year old William Cody into the workforce to help support his family. He found a job doing horseback deliveries for freight company Majors and Russell, a company which later became Russell, Majors and Waddell who started the Pony Express. So young William found himself riding for the Pony Express by the time he was fourteen years of age. When the Civil War broke out William initially joined with a group called the Kansas Redlegs which was an irregular band probably best described as guerrillas and their conduct was such that William left the group after about a year and a half and joined a regular unit of the Union Army. William Cody served as an army scout during the post Civil War Indian Wars. After the Civil War William Cody found work as a scout with the US Army and was highly successful in this role, so successful that he received the title “Chief of Scouts” and the Medal of Honor. William had been raised in a family that truly believed that “All men are created equal” and so he treated Indian scouts with respect and earned their friendship. His ability to cooperate and work with the Indian scouts was likely one of the key reasons he was able to succeed in that role so well. Later in his days as the head of his wild west show William Cody would employ native Indians and he described them as “the former foe, present friend, the American”. He treated them as equals and was very much ahead of his time in this, just as his father Isaac had been. He was also strongly in favor of treating women as equals and said “What we want to do is give women even more liberty than they have. Let them do any kind of work they see fit, and if they do it as well as men, give them the same pay. 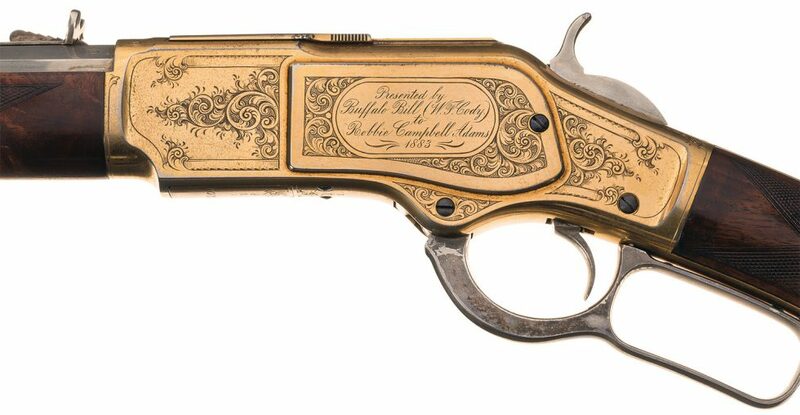 The Winchester 1873 in .32WCF engraved and signed by John Ulrich that William Cody presented to Robbie Campbell Adams in 1883 that is coming up for auction by Rock Island Auction Company over 9th-11th September 2016. 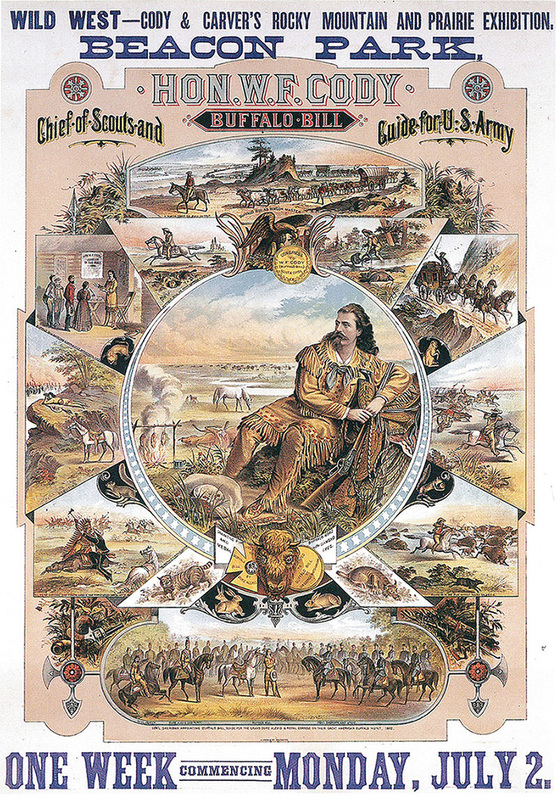 As the Wild West began to be tamed and fences were stretched across the prairie, and the Buffalo became an endangered species, William Cody moved from the Wild West reality to creating a show that would vividly portray a world that was fast vanishing. Its the sentiment that Lieutenant John Dunbar expresses in “Dances With Wolves” when he says “I want to see the frontier, before its gone”. William Cody wanted to provide an experience of what the frontier wild west had been to audiences, some who had experienced it, and many who had not. His show certainly had such a ring of truth and reality about it that Mark Twain was deeply impressed. 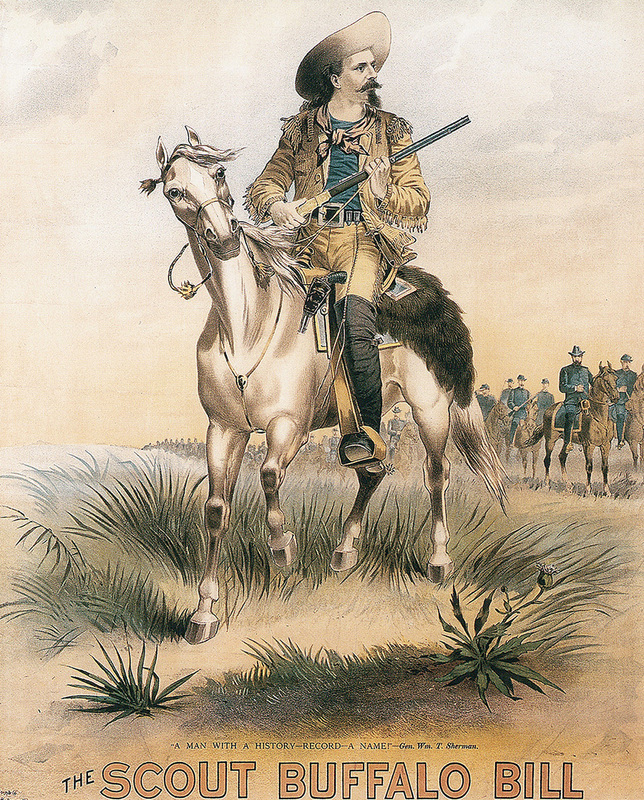 Included in the show were people who had been a part of the Wild West including Chief Sitting Bull of the Sioux who had defeated General George Custer at the Battle of the Little Bighorn, lawman Wild Bill Hickok, and people who would become legends of the show itself such as “Little Miss Sure Shot” Annie Oakley. This rifle was presented when Buffalo Bill’s Wild West was performing at Madison Square Garden. Buffalo Bill’s Wild West toured not only in the United States but also in Europe including Royal Command performances for Queen Victoria and the Tzar of Russia. No doubt the stories and portrayals were perhaps somewhat larger than life. But Buffalo Bill’s Wild West served to create the legend that the real Wild West has become. Legend that ensures a fascinating stream of Western movies from Hollywood, and legend that has ensured the creation of Cowboy Action shooting in the United States and even its Australian cousin Colonial Action. 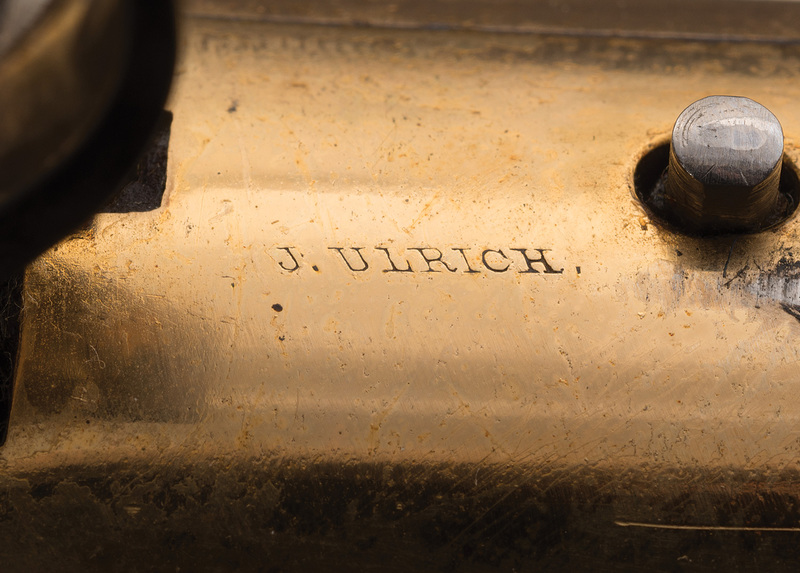 This presentation rifle is signed by master engraver John Ulrich. The Winchester Model 1873 engraved by Winchester’s own master engraver John Ulrich and presented by William Cody, the man who gave the Wild West to the world, is to be auctioned by Rock Island Auction company over 9th-11th September 2016. This rifle brings together history, legend, and the reality of a man who believed in the equality of men and women of all races and who practiced what he preached. This is a physical historic link with Buffalo Bill and the legend he created. You will find the Rock Island Auction page with much specific and documented information about this unique rifle if you click here. William Cody aka Buffalo Bill. A man who lived the sentiments spoken by President Abraham Lincoln in his Gettysburg Address.